Events have been conspiring to make me more and more aware of my health, including my diet, weight, and exercise. I need to lose at least 20 lbs and have been “trying” to lose 5 for about 5 years. I saw a good friend for the first time in several months and she had lost a significant amount of weight– she looked great! Of course I asked what she had changed, and she said she was eating a combination of paleo and real food. Was she exercising? Not really. She said as she eliminated bad food and allergens from her diet, she felt better and just naturally moved more, but she had not been doing a cardio routine or anything like that. She recommended a book called Practical Paleo. Then my son began losing weight. He’s always been big– he weighed 9 lbs when he was born; always wore 2-3 sizes larger than his age; was a head taller than most kids in his class. But his weight had gotten way too high and he was having high blood pressure issues at a very young age. (He’s 27.) High blood pressure runs in Mr X’s side of the family, but not beginning that early. And in May I’d gone for an annual checkup and my cholesterol was a bit high. The doctor said it needed to come down, so try diet and exercise, have it tested again in the summer, and if it didn’t lower I would need to take medicine. I’m determined NOT to do that! 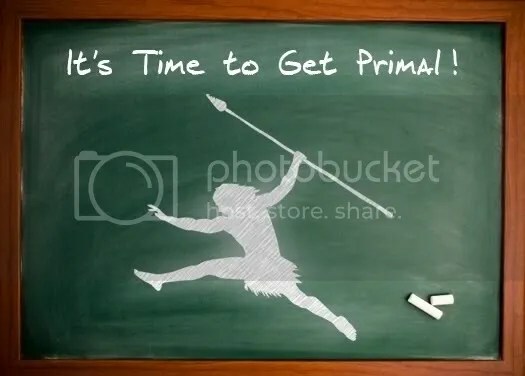 So the past month I’ve been working toward a real food/paleo/no allergen diet, and “moving” (I like that term better than “exercising”) more than I have been before. 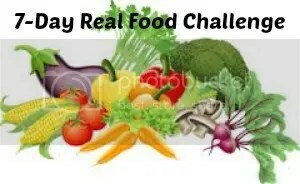 Then, in that funny way God has of working things together for our good, I found Mary’s Kitchen’s 7 Day Real Food Challenge. I don’t even remember how I found her! But I thought participating would be good incentive for me to stick with it and also help me do it better. It officially kicks off tomorrow. 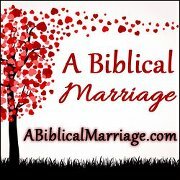 I’ll be doing posts this week about what I’ve learned. 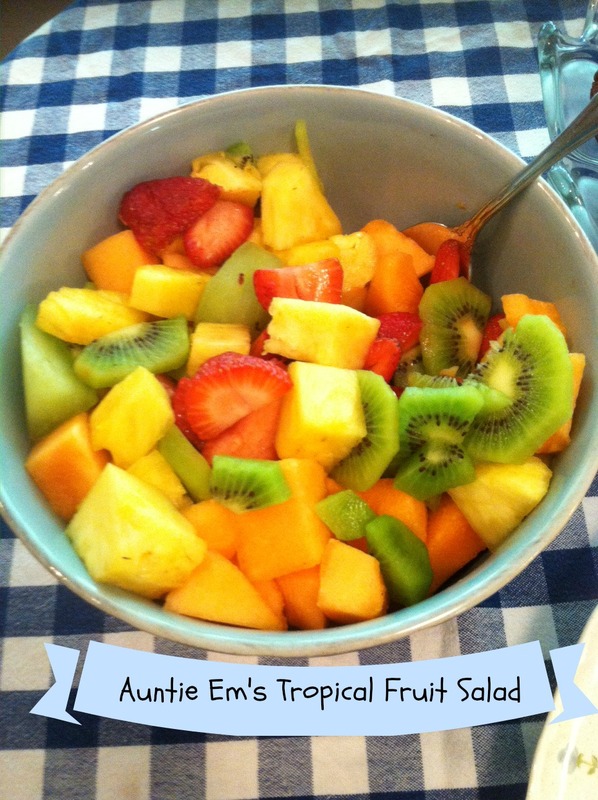 I just cut up lots of fresh fruits: watermelon, honeydew, cantaloupe, strawberries, kiwi, and pineapple. Try to cut them all in similar size chunks. Mix together and you have a beautiful, sweet, healthy dish! Shake it up with a dressing of some kind, or whipped cream– or add nuts or coconut. We like it plain, though! 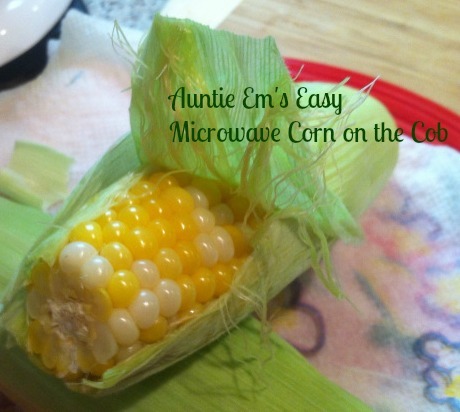 Did you see that pin floating around Pinterest about microwaving corn on the cob in the husk? 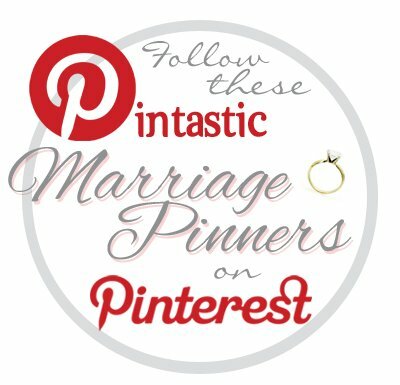 How the silk would slip right off? I was skeptical! 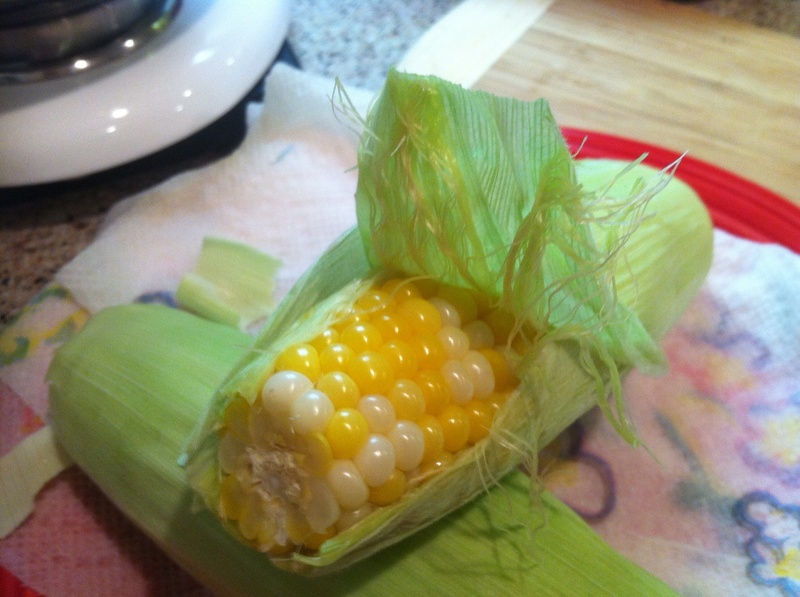 I’ve dug little strings of cornsilk out of boiled corn plenty of times, only to leave enough to floss my teeth with! But in the spirit of adventure (and the fact that the ears were 16 cents apiece!) I decided to try it. First I peeled off the thick, dark green layers, leaving only a thin covering. 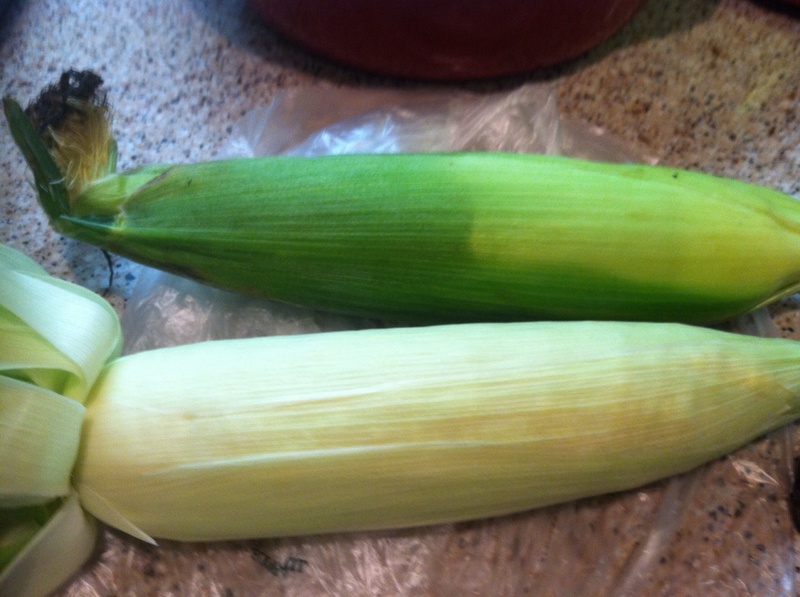 See the outline of the kernels? 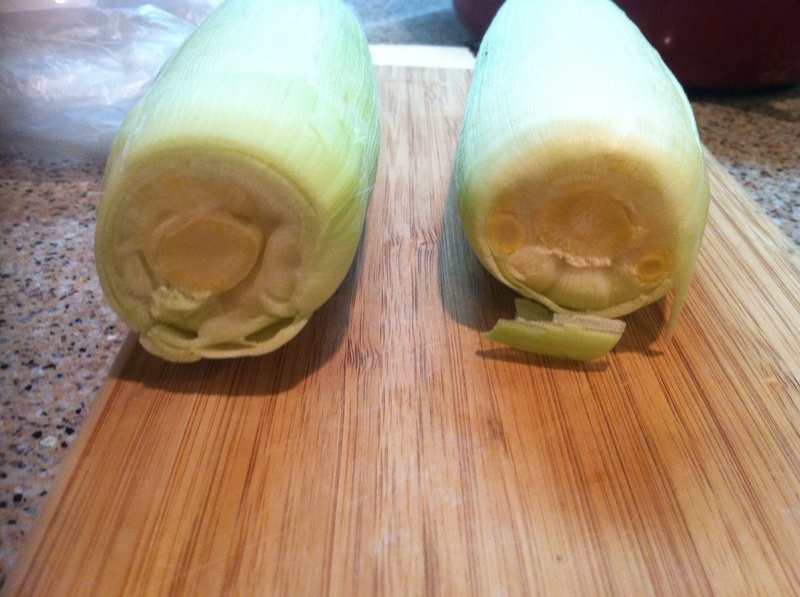 Next I rinsed them off and cut the outside husk off. I microwaved on high for 2 minutes; turned them over and did 2 more minutes. 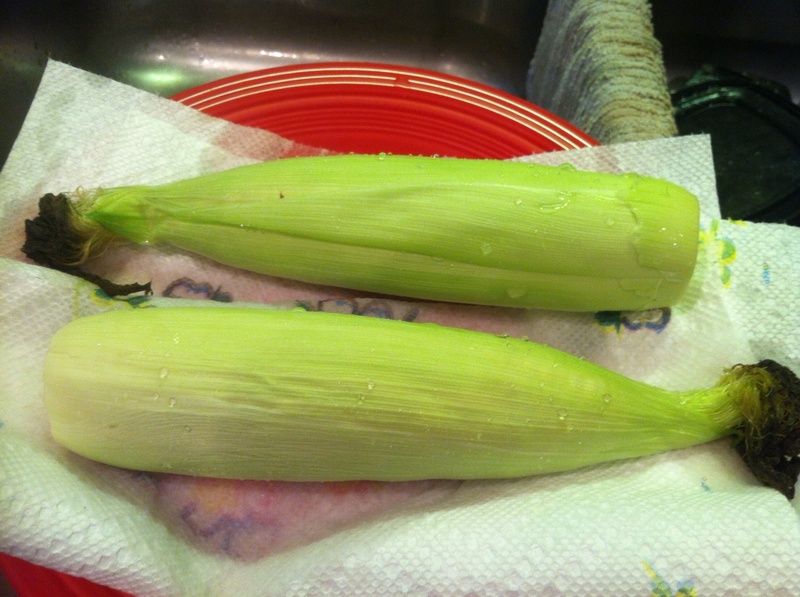 Let them cool in the microwave about 5 minutes (so you can handle them), then peel the husk off. The moisture holds the silks together, stuck to the husk! I like mine with butter– ahh, simple, golden deliciousness!